With our years of experience in everything from small rehearsal dinners to large weddings, corporate picnics to graduation parties, we can help. You can trust us to partner with you to create a memorable experience for you and your guests. There is a real fire in our Italian style brick oven. Your guests will see their food being made right in front of them. This is an authentic, old world, wood-fired cooking experience that you and your guests will not forget. We use the finest ingredients available. Our sauces, dough, and sausage are all house made. Our dough is made using a slow fermentation process for an incredible crust. We even grow our own shiitake mushrooms. We use locally grown, sustainably produced products whenever possible. We partner with local farms and CSAs to create the freshest, best tasting pizza around. We will work with you to design a menu to fit your needs. We can easily make appetizers, salads, a main course of pizza, wonderful deserts, even hand-crafted drinks like raspberry lemonade or ginger limeade. Together we can create a memorable event. Vegetarian, vegan and gluten alternative options are available. We are located in the beautiful St. Croix River valley, just north of the city of St. Croix Falls. A $250.00 deposit is required to reserve a date. 50% of total estimate is due at least 90 days in advance. Our minimum party charge is $750 for weekdays, $1000 for weekends. 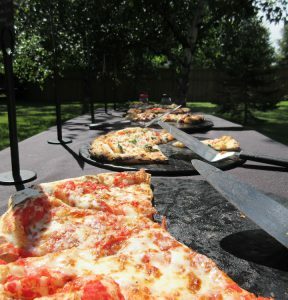 Pricing begins at $15.00 per person for buffet style pizza. Children under 5 are free. We will keep making fresh, hot pizza until your guests are satisfied. New for 2016 – Open House pricing plans! We offer many items in addition to pizza, including salads, appetizers, antipasti, sweet treats and non-alcoholic beverages. We do travel – up to 2 hours from our home location. (Distance fee may apply). We are available May through October. Outside our normal operation period, we consider events on a case by case basis. Please call us if you are interested. Click here for our catering policies.